Cape Town - An injury-time penalty at the Royal Bafokeng Stadium on Wednesday earned Golden Arrows a 1-0 win over Platinum Stars and top spot in the Premiership. 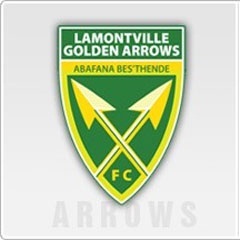 Stars had the first opportunity of the match after five minutes when Bonginkosi Ntuli went in on goal, but Arrows defender Limbikani Mzava got back smartly to intervene. Ntuli was again denied when his ball across the box was cleared by Siyabonga Dube. Kudakwashe Mahachi had an opportunity for the Durban outfit on 15 minutes after some slick interplay, but he fired wide of the target before Stars keeper Mbongeni Mzimela made an excellent block on Lerato Lamola's near-post shot. Dikwena were to wrestle back the initiative as they stifled Arrows' attacking efforts, although apart from a 42nd-minute free-kick which went wide from Vuyo Mere, the team from Rustenburg also didn't look likely to score before half-time. The hosts continued to look dangerous after the break, but they couldn't make the breakthrough as Ennocent Mkhabela's 52nd-minute header was saved by Nkosingiphile Gumede, who also stopped a well-struck effort from Mere moments later. Mere had another chance in the 68th minute but his low drive whistled inches wide, before Thabang Sesinyi was denied by a brilliant save by Gumede eight minutes later. Stars will have felt they deserved at least a point, but were cruelly denied when Mahachi stuck in a 92nd-minute penalty after Ryan De Jongh had infringed in the box.